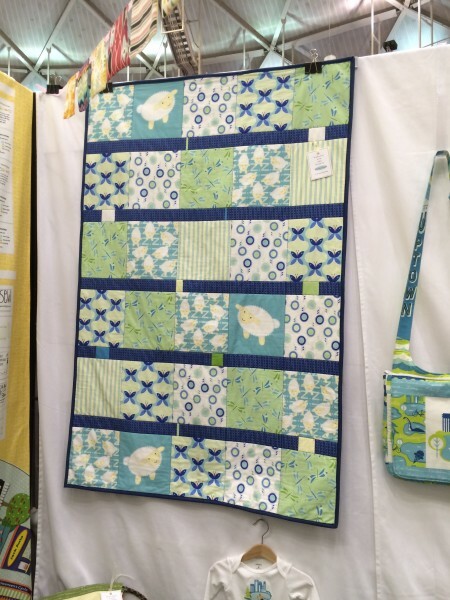 Building on Tuesday’s post with interviewees Kathy Hall and Lonni Rossi, today we are excited to share two more of Jamie Kalvestran’s Quilt Market interviews, with textile designers Cindy Lindgren and Jane Sassaman. Enjoy! I first crossed paths with designer Cindy Lindgren a number of years ago while taking a course at the Minneapolis College of Art and Design. 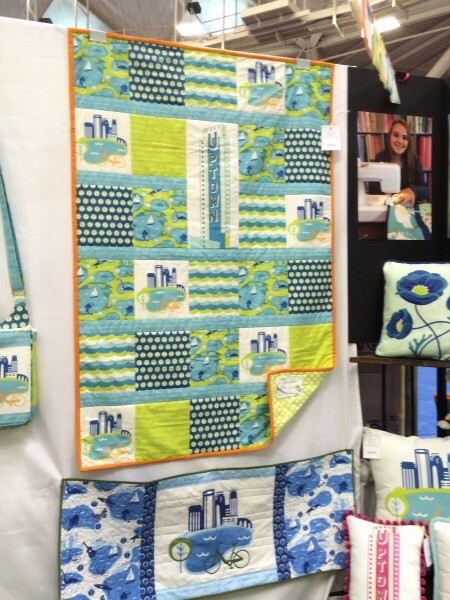 Thanks to social media we have been able to stay in touch over the years and I was delighted to hear that she would be exhibiting her fourth collection titled: “City of Lakes” with Modern Yardage at International Quilt Market. Cindy can you tell us the inspiration behind your latest collection? City of Lakes is my tribute to Minneapolis and its city lakes connected by paths thru out the city. I live close to Lake Harriet and enjoy walking, biking, listening to concerts and getting ice cream at the bandshell and even cross country ski on it when it freezes over in winter. 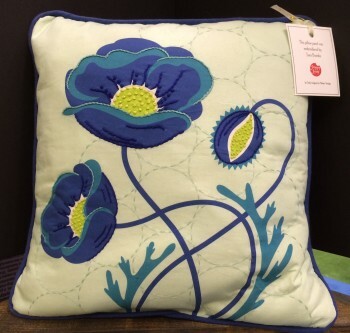 Modern Yardage is a digital printing company with the flexibility to print niche themes and get it launched quickly. My collection includes a summer print, winter print, waves, trees, Minneapolis lake names – all in three scales and 4 color ways. 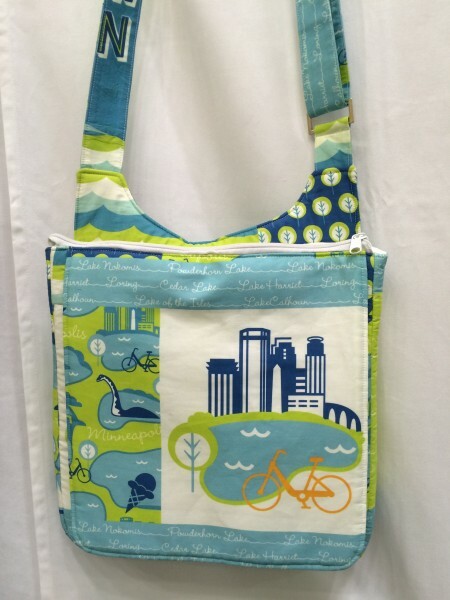 There are also icon panels of Minneapolis with a bike, a skier and the Uptown image available in 3 sizes online and also wholesale. My City of Lakes convenience quilt has been very popular and incorporates several of the prints in the marine color way. It is available now online HERE. Wholesale inquiries can contact Modern Yardage directly. 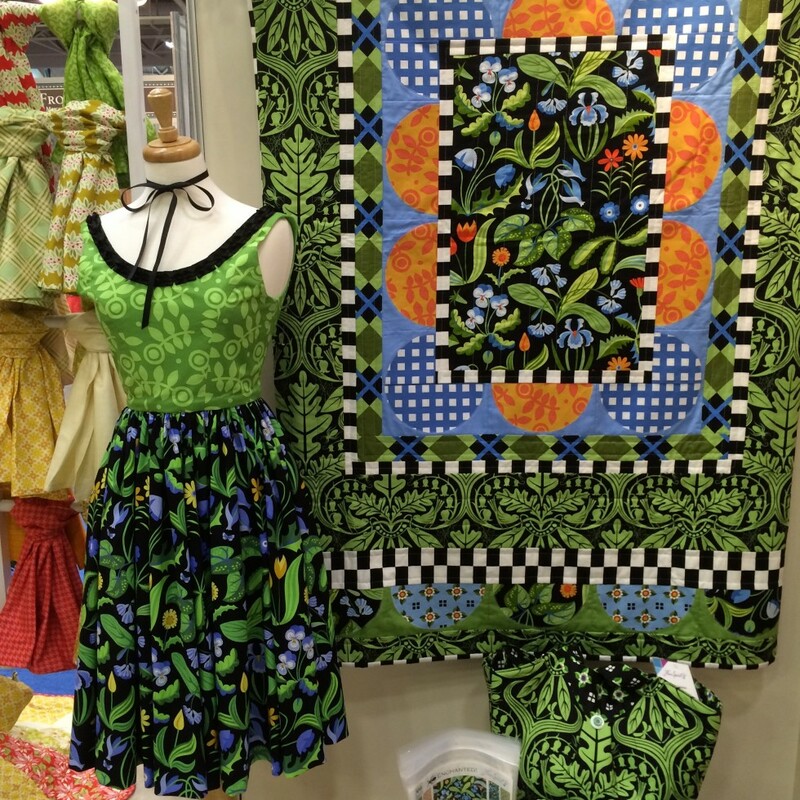 What trends are you seeing in the quilting marketplace? I haven’t been in the quilting business long enough to honestly spot trends, so ask me that question in a few more years. : ) This was the first time for Modern Yardage and for me to exhibit at International Quilt Market here in Minneapolis. There were so many beautiful collections. Personally, I enjoy the direction of clean bright colors in fresh images in geometric compositions. My choice of colors are developing more consistency so for example, the lime coordinate in my first Poppy Hop Collection can be used with the lime in the City of Lakes Collection. What advice would you give designers about putting a portfolio together for this industry? Your portfolio needs to be you. Find your voice and develop who you are. Be consistent and persistent and grow with each collection. Having great photographs of your work is also crucial to communicate clearly and look professional. What do you spend most of your time on when running a licensing business? The business end does take up more of my time than creating art, but it’s just as important if you want it to be a business and not a hobby. I do as much as I can myself, but have someone help me with Quickbooks and I have friends who sews samples from my fabrics for shows. I also take online classes to learn computer programs and social networking programs that benefit my business. Can you make a living from licensing? It takes multiple income streams to add up to a living. I have an Etsy shop, Etsy Wholesale shop, a wholesale retail rep in the Midwest for my cards and art prints, consign with a local shop, have licenses with a few manufacturers including Janome and do freelance design and Illustration. Were you already in the quilting industry before you began designing fabric? If yes, what was your role? I was not in the quilting industry before designing fabric. I took a college class (with you)! 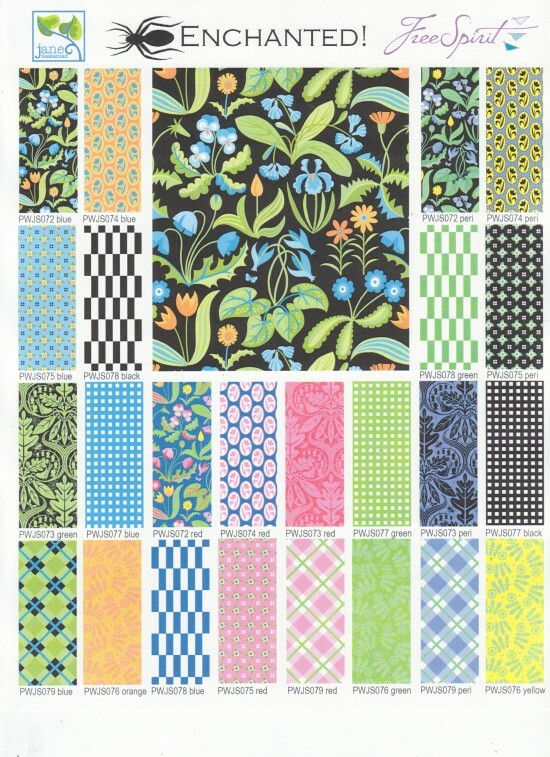 to learn to create repeat patterns and practiced through Spoonflower. Modern Yardage saw my designs there and contacted me to work with them. I also spent a lot of time at a local fabric shop, The Linden Tree, looking at designer collections and talking with the owner, and getting her opinion on my collections as they developed so I’d have a sewing perspective and not just a design perspective. P.S. Be focused and believe in yourself. 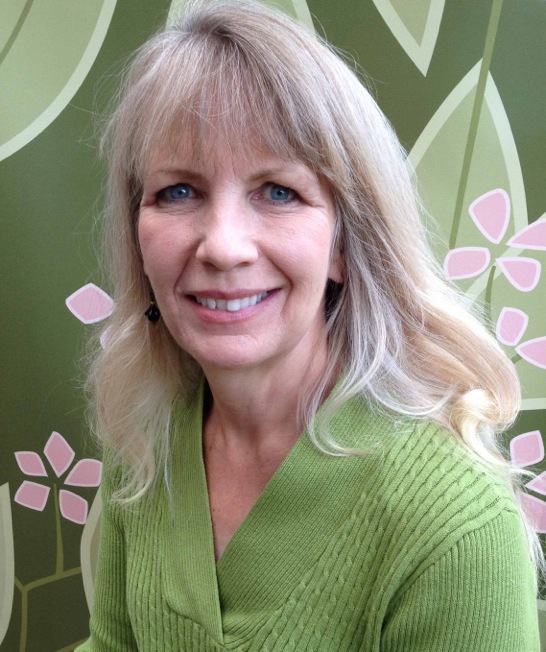 I first met Jane Sassaman about ten years ago at International Quilt Market. It was one of those more or less embarrassing moments in life. You see, I had been a major fan of Jane’s work after reading her book The Quilted Garden published by C&T Publishing. Jane is an award winning competition quilter known for her bold designs and brightly colored nature inspired quilts created with exceptional craftsmanship. I followed Jane’s work and bought her lovely fabric like a true ‘groupie’. At the time of our first meeting, I was in my booth exhibiting and Jane was quietly walking the show. I saw her and blurted out a big ol’ “JANE”!!! Which stopped her dead in her tracks, I am sure wondering who the heck I was! Since then we have bumped into each other many times at Quilt Market and dare I say, we have become friends! Without further ado, please enjoy this exchange with myself and Jane Sassaman. Jane please tell us the inspiration behind your new collection Enchanted for Free Spirit? I am a nature girl so that is the basis of everything. Most of the subjects come straight from my own back yard. There is usually a signature floral as the focus fabric and the other designs are supporting characters. This season I was channeling the Viennese Secession (turn of the century movement of visual artists in Vienna, Austria) and the Wiener Werkstatte, a production company founded on Secessionist principles. This has always been one of my favorite periods of design. These artists had a desire to affect their entire environment and designed everything imaginable, from toys to townhouses. They were inspired by native folk motifs, but were also influenced by the contemporary geometric designs of Scottish architect, Charles Rennie Mackintosh. As a group, they repeated motifs and proportions that make their work easily identifiable. For example, the rectangular checkerboard was a favorite pattern. I see the trend from the modern quilter filtering in hugely. White, cleaner, clearer designs. And small woodland creatures are everywhere. What advice would you give designers for putting a portfolio together for this industry? You have to do the work. So that means you are doing work that nobody is paying for. But this also means that you can do anything you want; be your unique self. It is your chance to do your best work. It is your unique style that will make your work desirable. Start with some signature designs and then add some simpler supporting characters. When you are happy with your group of designs, make them in at least three different color ways. Put together a portfolio of collections that reflect your style consistently. What do you spend most of your time on when running a business like this? I love the designing and that’s where most of my energy goes. There is also lots of time spent making things with the fabric to show its potential. I’m not as excited about the other aspects of the business, unfortunately. I would love to partner with someone whose art is business! The other part of my livelihood is as an art quilter and teacher. Sometimes I feel like I have a foot in two different worlds and I’m constantly trying to find a more satisfying way to tie them together. Were you in the quilting industry before you began designing quilt fabric? I was actually a designer of decorative accessories, plates, picture frames, candle sticks etc. I discovered quilting in 1980 when Nancy Crow’s quilt was on the cover of American Craft. Quilting supplies all the elements that satisfy me… color, scale, engineering, craftsmanship, fabric and autonomy. So I started making quilts when I was still a freelance designer of decorative accessories and eventually the quilting took over. And now I’m designing again, so I’ve gone full circle. Where do you find inspiration and stay on top of trends? Two printed publications that I enjoy are World of Interiors and Selvedge magazine, also Design Sponge and Pinterest online. As an artist, it is our job to have our antennas alert at all times. Inspiration can come from anywhere if you are paying attention. Any parting words of wisdom for our readers? You have to have some kind of spark or sparkle that is going to make someone want your stuff. Spend a lot of time finding your own voice. Jane’s collection Enchanted will be available in stores in July! Sign up to receive our free Quilt Market Guide HERE and stay tuned for more interviews in this series coming soon!